Bernie Sanders showed them what they should have done. It’s long been a complaint of the American left that establishment Democrats don’t truly understand their own voters, and have spent the last three decades compromising their alleged principles—a euphemism for “slowly moving to the right and giving up everything they’re supposed to stand for”—as Republicans bully them into submission. Leaders on the right have fought without remorse or shame for the exact policies they want (all of which amounts to more money for the rich), using dirty tricks when necessary, but Democrats have lacked the courage to deliver a populist message to counteract them. 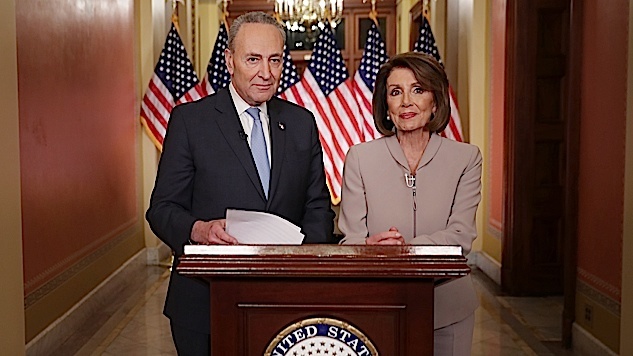 The dual faces of this failure in Congress are Chuck Schumer, the minority leader of the Senate, and Nancy Pelosi, the Speaker of the House. Last night, their role was to deliver the rebuttal to Trump’s “humanitarian crisis” propaganda speech. On a superficial level, it wasn’t much of a coup—they both looked stiff, and their tone and cadence was reminiscent of nothing more than a pair of cold grandparents lecturing a child. They purposefully avoided the word “lies” when referring to Trump, going instead for “misinformation,” and you can see their desperate desire to be cast as the “reasonable” party—so much so that there’s not much oomph or fight in the presentation. As to the words themselves, while they contradicted Trump’s claims on a surface level, they implicitly endorsed his worldview by attempting to argue against him using his own prejudices. Not to diminish the importance of so-called “border security,” but here Pelosi made her priorities clear: “We did what the Republicans wanted,” she effectively says, “it’s just that Trump is a bad Republican.” She does not argue for the humanity of the poor people trying to cross into the United States, or condemn the bigotry of Trump’s attempt to paint them broadly as terrorists and rapists and murderers and every other species of criminal. Instead, Pelosi is appealing to the imagined beliefs of an “ordinary” American—ie, someone white, and possessing at least a few of the watered-down prejudices Trump broadcasts on a daily basis. Instead of “immigrants are not bad people,” she went with a display of her own apparent toughness on border security, which concedes ground to the Republicans right from the start by painting those immigrants as invaders. She may well have said, “and many of those workers…own puppies.” When mentioned alone, ignoring the other groups this shutdown hurts, it’s cheap and manipulative. In fact, we don’t all agree on that, though Pelosi would never deign to even recognize a position that deviates from the center-right. This is the one decent part of her speech, but even then it’s qualified—the women and children, apparently, are the only decent ones. Again, it’s a patronizing pull at the heartstrings, and it glosses over the critical point: The men are not a security threat either, anymore than any U.S. citizen, and immigrants as a class don’t deserve to be demonized wholly or in part. Again, why must he concede Trump’s perspective here? Why say “we all want stronger border security” when in fact it’s a crisis wholly manufactured by the right to stir up racial resentment? Why not instead discuss immigrants as human beings facing grave challenges, instead of lazily accepting that they’re an occupying force that needs to be defeated by better robots, or dogs, or x-rays, or something? Again, as with Pelosi, we see Schumer’s unquenchable need to phrase things in Republican terms. Who, in his mind, does the center-right voter fetishize? Farmers, small businessmen. Pelosi chose veterans, but it’s all the same—they have to seek out and identify a special class of people, as though causing them pain is somehow a greater outrage. They are, in this telling, worth more. Overall, Schumer’s words are less offensive than Pelosi’s, but it doesn’t take much to detect the subtle concessions to a Trumpian/far-right worldview. Here, though he does mention refugees, he still stresses the need to “secure” the border, which contradicts his previous claim that Trump is manufacturing a crisis. Why not call it out for a blatant lie and argue vociferously in opposition, rather than accepting the premises of the argument while quibbling with the conclusion? If these people are our leaders, who is arguing for the American left? The answer is Bernie Sanders, among others. They wouldn’t let him anywhere near a TV network, but he gave his response on YouTube, and it hits all the notes Pelosi and Schumer could not. President Trump has stated tonight, and, over and over again in recent weeks, that this country faces a national emergency. Well, he’s right. But it’s an emergency and a crisis that he himself has created. Which is not to say you can’t mention those people, or that they’re not deserving of respect! Sanders, in fact, mentions them all, but he also mentions pregnant mothers and innocent babies and homeowners and elderly people on food stamps. For him, there is no extraordinary class, just a collection of Americans who equally deserve responsible government. President Trump tonight has told us why he believes we need the wall. It gives me no pleasure to tell you what most of you already know. President Trump lies all of the time – and in his remarks tonight, and in recent weeks regarding immigration and the wall, he continues to lie. It is inhumane that tiny children at the border have been torn away from their parents. It is disgraceful that 1.8 million young people, raised in the United States, and who know no other country but the United States, have lost their legal protection under the DACA program because of Trump’s actions. It is heartbreaking that almost 11 million undocumented people living in this country, the overwhelming majority of whom are hard-working and law-abiding, worry every day about being deported and separated from their loved ones. Then he listed the greater crises facing our country: Healthcare costs, elderly poverty, starvation wages, and climate change. In every sense, Sanders outclassed the purported leaders of the Democratic party, and in doing so showed yet again why his candidacy gained such momentum in the 2015-16 primary campaign, and why he should be considered the frontrunner for the 2020 nomination, should he choose to run.